Disappearance festival of the founder of the Sri Chaitanya Math and worldwide Sri Gaudiya Maths, Bhagavan Sri Srila Bhakti Siddhanta Saraswati Goswami Prabhupad. Sri Sri Dayita Dasa Dasakam - 'Ten prayers offered unto Sri Dayita Das' - Word-by-word translation. Composed by Srila Bhakti Raksak Sridhar Dev-Goswami Maharaj after the withdrawal of Om Visnupad Sri Srimad Bhakti Siddhanta Saraswati Thakur's lila. Posted on premadharma.org website. The grand 90th appearance day celebration of Sri Chaitanya Saraswat Math's Sevaite-President-Acharya, Om Vishnupad Paramahamsa Parivrajakacharya Sri Srimad Bhakti Sundar Govinda Dev-Goswami Maharaj. "Mahaprabhu said, 'You chant without offense the Hare Krishna Mahamantra and you will get everything.' ... It's necessary only a master to guide you. Why is it necessary? The point is here: without proper guidance you must do offense to the Name." Digitalised Vyasa Puja edition of Sri Vaishnava Toshani magazine published by Sripad B.S. 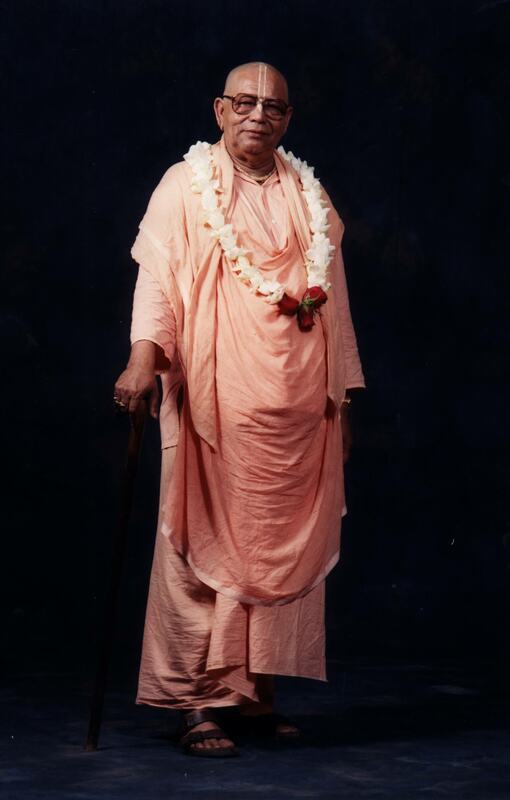 Vaishnav Maharaj in December 1993. The entire magazine is dedicated to Srila Gurudev Srila Bhakti Sundar Govinda Dev-Goswami Maharaj's glorification. It includes articles by Srila Guru Maharaj Srila Bhakti Raksak Sridhar Dev-Goswami Maharaj and Srila A.C. Bhaktivedanta Swami Maharaj as well as many offerings by the devotees. Made available by Giridhari Prabhu of Hungary in digital pdf and epub form, posted on jayasri.org website. Amavasya. Disappearance of Srila Jagabandhu Bhakti Ranjan. Poem by Sripad Jagabandhu Bhakti Ranjan cited by Srila Bhakti Sundar Govinda Dev-Goswami Maharaj as he discoursed about the paramount importance of service to Sri Guru. Posted on the Math's premadharma.org website. Disappearance of Srila Narahari Sarkar Thakur and Srila Kaliya Krishnadas. Disappearance of Sriyukta Dhananjay Das Prabhu. Sripad Dayita Das Prabhu (Dhakuram Prabhu) passed away this morning in Sri Vrindavan hortly before 9 o' clock. He had attended mangal-arati as usual and played the gong throughout. He was very dear to Srila Gurudev Srila Bhakti Sundar Govinda Maharaj, and he was the long-time servitor of our large 'Srila Sridhar Swami Seva Ashram', Govardhan. After becoming aged Dayita Das Prabhu repeatedly lamented that he wanted to do so many services in the Ashram as he had always done, but his body was no longer able to do so. In recent years Dayita Das Prabhu moved to our smaller Vrindavan Temple where he continued in service until this day. Once the very elderly and dedicated Dayita Das Prabhu, affectionately known as Dhakuram Prabhu, came up to Srila Gurudev's room. As always, he made his way slowly past the seated devotees to the front of the room where he intently offered flowers to Srila Gurudev's lotus feet. Srila Govinda Maharaj always would give his attention to Dayita Das Prabhu's offering ... When Dayita Das Prabhu then carefully gathered up the offered flowers and left the room, Srila Gurudev commented that this prabhu is very dear to Srila Guru Maharaj. Srila Gurudev once gave him the instruction that offered flowers have special respect, and since that time, many years ago, he has always gathered each tiny flower he offers and puts it in the proper place. Srila Bhakti Sundar Govinda Dev-Goswami Maharaj said, "He breathes, so we breathe; he's alive and so we are alive." He is so humble, no one would know his exalted position. Disappearance of Srila Raghunath Das Goswami, Srila Raghunath Bhatta Goswami, and Srila Krishnadas Kaviraj Goswami. Recordings and photos of Srila Gurudev posted daily, as far as possible, by Jamuna Priya Devi Dasi from her extensive archive collected over several years of personal service to Srila Gurudev Srila Bhakti Sundar Govinda Dev-Goswami Maharaj. 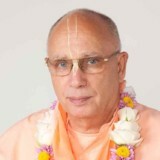 AbsoluteSweetness.org newly established principally for sharing lectures of Srila Bhakti Sundar Govinda Dev-Goswami Maharaj. Ratha Yatra of Sri Jagannathdev (and next day: Disappearance of Srila Svarup Damodar Goswami Prabhu). The Temple of Jagannath at Puri (880 KB pdf file), an essay by Srila Sachchidananda Bhakti Vinod Thakur first published in September 1871, and reprinted in the Spring 1994 edition of 'Counterpoint' magazine. Sri Jagannathdev, by Srila Bhakti Raksak Sridhar Dev-Goswami Maharaj. An excerpt posted on jayasri.org from the Spring 1994 edition of 'Counterpoint' published by Sripad Devashis Prabhu. Audio: "In the transcendental world, so many groups are there, but we are all the exclusive followers of Radha-Krishna and Mahaprabhu." 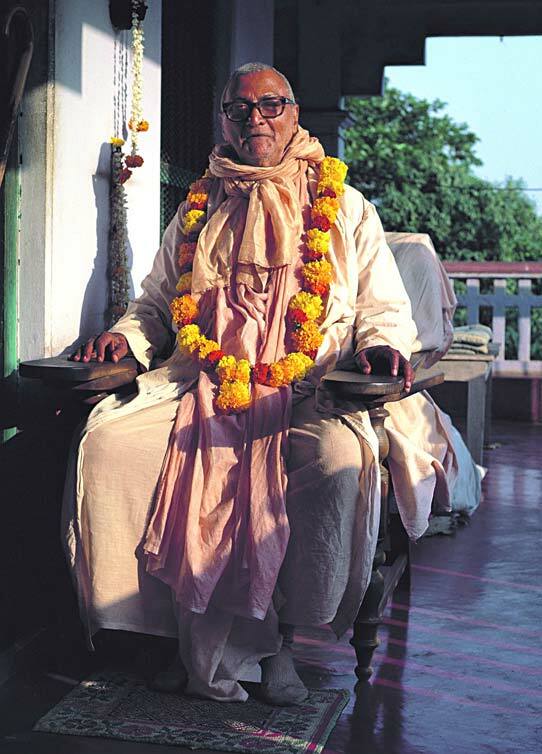 Disappearance of Tridandi Swami Srimad Bhakti Saranga Goswami Maharaj. Audio: "One day you will see your sky is clear from clouds." Sri Nrisimha Chaturdashi: appearance day of Sri Nrisimhadev. Full fast until after sunset, then no grains (anukalpa). Audio: Discourse on Sri Nrsimha Chaturdasi, 1997, Soquel, California. Srila Bhakti Sundar Govinda Dev-Goswami Maharaj's extensive talk at our Sri Chaitanya Saraswat Seva Ashram, principally describing and glorifying Sri Nrsimhadev, Prahlad Maharaj and their Pastimes. Audio: Singing on Sri Nrsimha Chaturdasi, 1997, Soquel, California. On the 50th anniversary of Srila Bhakti Sundar Govinda Dev-Goswami Maharaj's arrival at Sri Chaitanya Saraswat Math and the lotus feet of Srila Guru Maharaj, His Divine Grace first sings 'Goptritve Varana' by Srila Bhaktivinod Thakur, then leads a lively kirtan culminating in the Mahamantra. Vaishnava Calendars for worldwide locations are now available, with Ekadashi fasts calculated for various locations according to the rules accepted in Sri Chaitanya Saraswat Math. In addition, each calendar listed there is now available in html, pdf and webcal formats. Sripad Bhakti Bhushan Puri Maharaj passed away today at 4:15 a.m. His Holiness was the long time resident sannyasi leader of our Sri Chaitanya Saraswat Math, Puri. He led by example and was much respected and loved by all. Sri Gauravirbhava Paurnamasi. Sri Gaura Purnima. Divine appearance of Sri Gauranga. Total fast until moonrise, then no grains. Grand festival at Sri Chaitanya Saraswat Math. Vasantotsav and Dol Yatra of Sri Sri Radha-Govinda. Special offering of worship and arati. Sri Chaitanya-charitamrita reading and mahasankirtan. End of year 532 Gaurabda. New Vaishnava Calendar 2018-2019 is now available here, with dates calculated for Nabadwip until next Sri Gaura Purnima (2019). New Year's Resolution: Full Surrender. Starting the new year with focus on Sri Sri Prapanna-jivanamrtam. Audio with transcription. Informal discourse by Srila Bhakti Sundar Govinda Dev-Goswami Maharaj, 31 December 2000, posted on the Math's premadharma.org website. "We can make our plan and programme for new year today. We will be fully surrendered to Lord Krishna, and fully surrendered means we will realise what full surrender is. Guru Maharaj's books always help us. Guru Maharaj (Srila Sridhar Maharaj) expressed the mood of surrender in a special way especially in Prapanna-jivanamrtam. We should read Prapanna-jivanamrtam at least today with attention. There we will get direction for our coming year. We must be able to satisfy Lord Krishna by the grace of my Guru Maharaj. I have no power over anything, but I believe full power is with him. You are all sons of nectar, and if you will connect with his divine book [Prapanna-jivanamrtam], you must be supremely benefited." Ekadashi (in Nabadwip). Fast. Disappearance of Om Vishnupad Paramahamsa Sri Srila Gaura Kishor Das Babaji Maharaj. Appearance of Tridandi Swami Srimad Bhakti Dayita Madhav Goswami Maharaj. Sri Bhishma Panchaka. Obeisances unto Srila Gaura Kisor Das Babaji Maharaj. Verses by Srila Bhakti Raksak Sridhar Dev-Goswami Maharaj and Srimad Bhakti Desika Acharya Maharaj offered in homage to Srila Gaura Kisor Das Babaji Maharaj. Complete with word-by-word translation and verse translations, posted on the Math's premadharma.org website. Bahulashtami. Manifestation day of Sri Radha Kunda. Sannyas day of Srila Bhakti Sundar Govinda Dev-Goswami Maharaj. Sannyas day of Srila Gurudev and manifestation of Sri Radha Kunda. Audio, transcript and Russian translation of discussion in English by Paramananda Prabhu and Bhakti Lalita Devi Dasi in Thailand celebrating this day in 2014. Posted on the Russian harekrishna.ru website. Appearance of Sri Vamanadev. Appearance of Srila Jiva Goswami Prabhu. Excerpt from a lecture in English in which Srila Gurudev recounts the story of Sri Vamanadev and Bali Maharaj given on 24 September 2007 in Lahta, Russia, with alternating translation into Russian by Srila Avadhut Maharaj. Transcript, video and audio posted on the Russian harekrishna.ru website. Excerpt about Sri Jiva Goswami from the same talk by Srila Gurudev of 24 September 2007. Transcript, video and audio posted on the Russian harekrishna.ru website. Sri Radhashtami. Srimati Radharani's appearance at noon. Fast until noon. Sri Radhastami, St Petersburg, Russia, 19 September 2007, discourse by Srila Bhakti Sundar Govinda Dev-Goswami Maharaj. Transcript and Russian translation, prepared by Tradish Prabhu and posted on the harekrishna.ru website. In appreciation of the senior Acharyas currently giving guidance, shelter and initiation in the exalted line of Srila Guru Maharaj Srila Bhakti Raksak Sridhar Dev-Goswami Maharaj and Srila Gurudev Srila Bhakti Sundar Govinda Dev-Goswami Maharaj. Throughout the last seven challenging years since Srila Gurudev's disappearance each of them has been tirelessly nourishing devotees by presenting Bhagavan Srila Bhakti Siddhanta Saraswati Thakur's noble mission given to us through Srila Gurudev and Srila Guru Maharaj. We invite all devotees, established as well as newcomers, to get to know each of these senior Acharyas better and thus continue to find nourishment and shelter in the present age. Here are some links (in alphabetical order) to start your acquaintance. These can be translated to other languages via Google Translate or similar. New Vaishnava Calendar up to Sri Gaura Purnima 2017 is now available. Vaishnava Calendars for Worldwide Locations with their duly adjusted Ekadashi dates are now also available. New Bengali Panjika is now available as a pdf file as well as a single page list of Ekadashi dates in Bengali (calculated for Nabadwip). Sri Sri Guru Gauranga Gandharva Radha Ramanasundar Jiu installation anniversary festival, at Sree Chaitanya Saraswata Krishnanushilana Sangha, Kaikhali, Kolkata. Glorification of Sripad Yudhamanyu Prabhu Seva Vikram by the devotees in California and around the world. Video of the Sunday programme at our Sri Chaitanya Saraswat Seva Ashram, with several speakers headed by Srila Bhakti Pavan Janardan Maharaj. YouTube videos in three parts: bhajans at the start of the programme | Srila Janardan Maharaj's talk | glorification by the assembled devotees. Additionally, in Thailand, Srila Bhakti Sudhir Goswami Maharaj headed glorification of Sripad Yudhamanyu Prabhu on his Monday LiveStream televised broadcast (81 minutes), with audio available separately (70MB) for download or listening online. Amavasya. Anniversary festival of the installation of Sri Sadashiva Gangadhar, Sri Govinda Kunda, Nabadwip. Sripad Yudhamanyu Prabhu Seva Vikram passed away from this world yesterday, Sri Sivaratri. Initiated by Srila A.C. Bhaktivedanta Swami Prabhupad, he came to the shelter of Srila Guru Maharaj and Srila Gurudev in the early 1980s. Through his surrendered devotional mood and activities he received the specific grace of each of these three greatest Acharyas. Sripad Yudhamanyu Prabhu will be greatly missed by all Vaishnavas world-wide, and especially so by his wife Jivana Devi Dasi, and the many devotees of China whom he introduced and nourished in Krishna consciousness. Also, in California, please see the announcement on the Sri Chaitanya Saraswat Seva Ashram's website, sevaashram.com. Disappearance of Srila Jiva Goswami Prabhu and Srila Jagadish Pandit. New Year's Day. Sripad Bhakti Prasun Aranya Maharaj passed away today in Nabadwip. 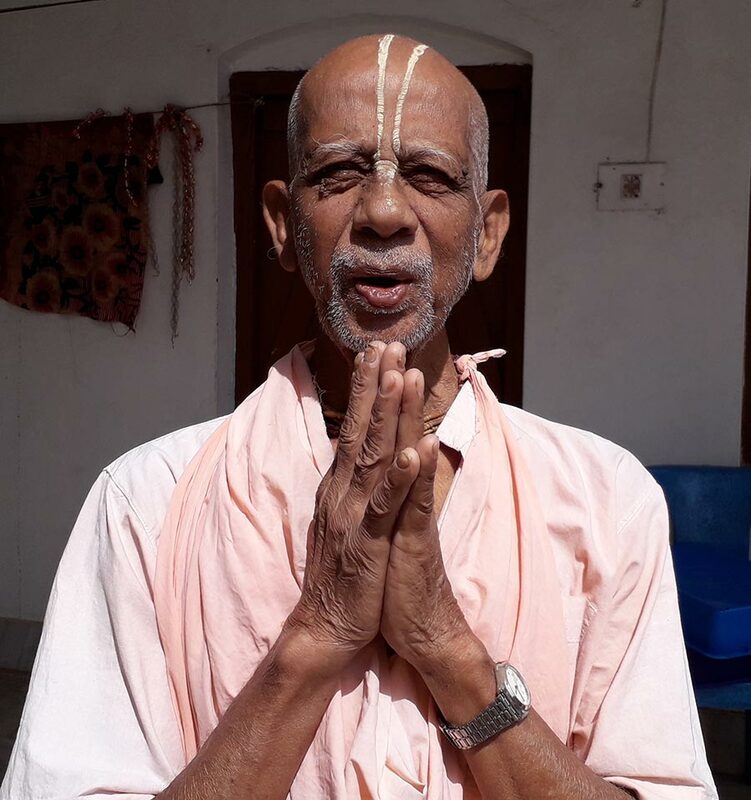 Known as elderly ever since the early 1980s, Sripad Aranya Maharaj was a disciple of Srila Guru Maharaj Srila Bhakti Raksak Sridhar Dev-Goswami Maharaj and was a senior Vaishnav resident of the Math. He tolerated poor health for many years, and with his passing he will be much missed by all devotees locally and abroad. Remembrance festival of Santosh Krishna Prabhu is being held today around the world by the many devotees who knew and respected this exemplary Vaishnava who passed away instantly in a tragic road accident ten days ago. Santosh Krishna Prabhu lived in Arjjun Pukur near Nadanghat in West Bengal, and was very dear to Srila Gurudev Srila Bhakti Sundar Govinda Dev-Goswami Maharaj. 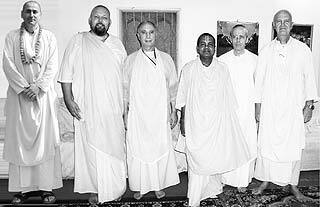 (Webpage of pictures taken on a spontaneous visit by Srila Gurudev to his home in 2007.) Santosh Krishna Prabhu continually served Sri Chaitanya Saraswat Math, Nabadwip, welcoming devotees and visitors and selflessly rendering much valuable assistance to Srila Bhakti Nirmal Acharya Maharaj in the maintenance and development of the Math and its various projects. We offer our condolences to his devoted family in remembrance of Srila Gurudev's special grace upon him. Thirty-nine Indian language pdf books of the Math are now available for free download due to the care and dedication of Anand Prabhu of South India. These include books in Bengali, Hindi and Oriyan. Festival in honour of the disappearance of Om Vishnupad Paramahamsa Parivrajakacharya-varya Ashtottara-shata-sri Srila Bhakti Sundar Govinda Dev-Goswami Maharaj. Audio: Srila Gurudev's message. "We will spend our time for the service of Lord Krishna and will pray to Him to give us good association and make a good environment for maintaining the life of devotion." In addition the Calendars for Nabadwip have been updated, including the 'ics' iCal version and the wall calendar. Sri Gauravirbhava Paurnamasi. Sri Gaura Purnima. Divine appearance of Sri Gauranga. Total fast until moonrise, then no grains. Grand festival at Sri Chaitanya Saraswat Math. Vasantotsav and Dol Yatra of Sri Sri Radha-Govinda. Special offering of worship and arati. Sri Chaitanya-charitamrita reading and mahasankirtan. End of year 530 Gaurabda. Audio: "The advent of Mahaprabhu Sri Chaitanyadev. Who was He and what for He came here? If we can understand it, then we understand the inestimable, highest end of life. Our concern with Gauranga and His birthplace, Nabadwip Dham, is of such importance." New iCal version of Vaishnava Calendar up to Sri Gaura Purnima 2017 is now available here, (ctrl-click, 'Save target' then install) for computers, iPads and smart phones, for automatic notification of special events worldwide as well as Ekadasi dates as followed in Sri Chaitanya Saraswat Math, Nabadwip, prepared by Sadhu Priya Prabhu of Australia. Sri Nabadwip Dham Parikrama begins. Parikrama of Sri Simantadwip, Sri Rudradwip, and Sri Antardwip. New Vaishnava Calendar up to Sri Gaura Purnima 2017 is now available here. -) And as a single page list of Ekadashi dates calculated for Nabadwip. New Bengali Panjika is now available as a pdf file. "You know that in Vrindavan Dham there is Raseshvar Siva, Gopishvar Siva, and many other forms of Lord Siva. We worship these forms. We offer pranam to Gopishvar Siva in this way: 'vindavanavani-pate jaya soma soma...'"
Posted on the Math's gaudiyadarshan.com website. The 144th divine appearance festival of the founder of the Sri Chaitanya Math and worldwide Sri Gaudiya Maths, Bhagavan Sri Srila Bhakti Siddhanta Saraswati Goswami Prabhupad. Anniversary festival of the installation of Sri Gupta Govardhan Sri Mandir, Sri Govinda Kunda, Nabadwip. Disappearance of Srila Purushottam Thakur. The Giver of our Fortune. Srila Bhakti Raksak Sridhar Dev-Goswami Maharaj lectures on the appearance day of Srila Bhakti Siddhanta Saraswati Thakur, 1982. Posted on the Math's gaudiyadarshan.com website. Appearance of Mahavishnu Avatar, Sri Advaita Acharya (because the previous day was viddha). Disappearance of Sripad Virendra Krishna Prabhu. Dual Functions. Srila Bhakti Raksak Sridhar Dev-Goswami Maharaj explains the identity of Sri Advaita Acharya. Posted on the Math's gaudiyadarshan.com website. Construction begins of the Philippines Branch of Sri Chaitanya Saraswat Math. Starting the New Year by getting building of the new Ashram under way, Ratnanabha Prabhu and Ishani Devi Dasi send a webpage of pictures of the first days of progress. Please see our Earlier Updates for and a full listing of thousands of earlier web-pages including pictures, reports, audios, videos, books, articles, etc. from Nabadwip, Kolkata and around the world. Plus a section of Srila Govinda Maharaj's World Tours with many links connected with his broad, affectionate preaching abroad.